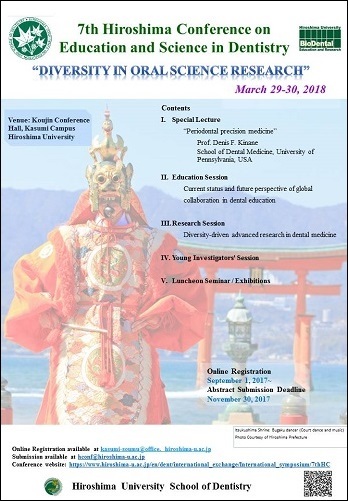 Hiroshima University School of Dentistry will hold “7th Hiroshima Conference on Education and Science in Dentistry” as the following schedule. The special theme for 7th HC is “Diversity in Oral Science Research”. We would like to warmly welcome those who are seeking great opportunities to present research works, exchange ideas on the latest dental medicine and oral health science, and facilitate international networks for scientific and academic collaborations. We ask you to cover costs related to transportation and accommodation except for invited speakers. Instead, we will support travel expenses for young researchers who actively attend the conference and present their work in the format of posters and oral presentations. ➢　This site will be updated each time new information becomes available. Please check back regularly for release updates. Registration Deadline for on-line registration is March 23 (Friday), 2018.